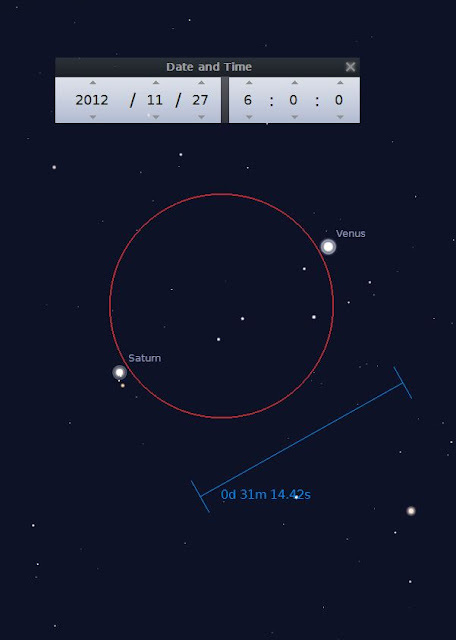 Jupiter Opposition will be happening on next Monday 3 December 2012 at 9:21am Singapore time. This event will be visible in most countries after their local sunset till next sunrise. (1) Jupiter and its moons will be nearest to Earth within a particular year. 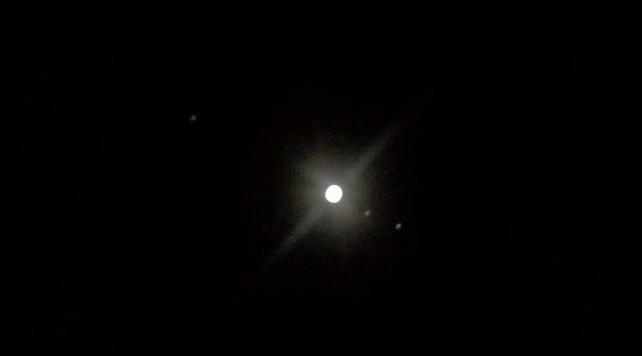 (2) Jupiter and its moons will be most brightly lit by the Sun. (3) When the Sun sets, Jupiter rises from the horizon and stay visible for the whole night till next sunrise. (4) This is the best time to observe, photography and study Jupiter from Earth. (5) Using the same astronomical instrument (e.g telescope), one will see and capture more details of Jupiter on this day compared to other days. For 2012, Jupiter Opposition occurs on 3 Dec. The exact timing of 9:21am is not really that important. This is because Jupiter does NOT suddenly grow larger or shrink in apparent size immediately before and after this opposition timing. The growing and shrinking of its apparent size is a GRADUAL process over many days and weeks. So you can start observing and photographing Jupiter from now till the next couple of weeks whenever the skies are clear and Jupiter is high in the sky. No need to wait for specific magical timing in early December. The apparent size of planet can be measured in arcseconds. 1 degree is equivalent to 3600 arcseconds. 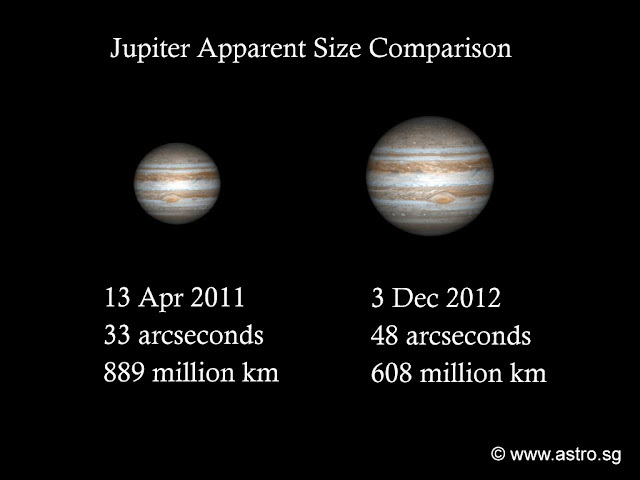 Jupiter at opposition in Dec 2012 is about 48 arcseconds. When it is very far away from Earth, its apparent size will be smaller. It will also look dimmer from Earth as a result of the increased distance. One arcsecond is extremely small and very difficult to detect visually even through a telescope. The apparent size of Jupiter (and all other planets) changes very slowly arcsecond by arcsecond over days. So again, there is really no need to panic if you cannot observe or photography it on 3 Dec 2012. Try again for the next few nights whenever the skies are clear. (1) During the opposition period, other than Venus rising from the East shortly before sunrise, Jupiter is the brightest star-like object in the night sky. (2) Like all other planets, it does not blink in the sky. 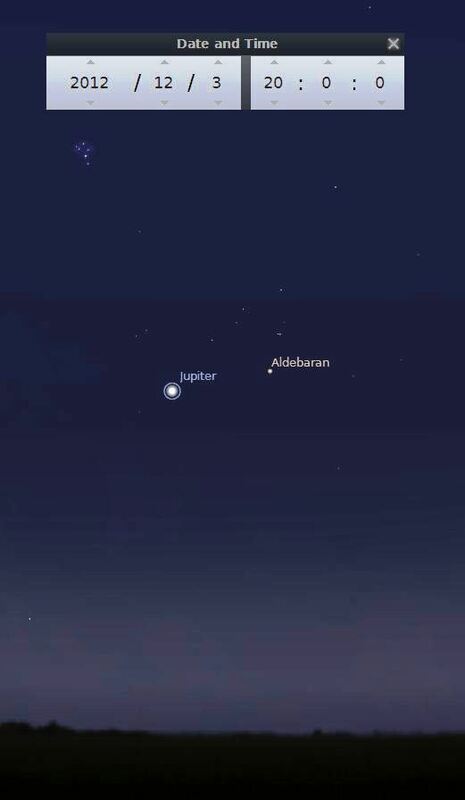 (3) Jupiter is near the bright star Aldebaran which is a red star. Use your hands to shield the stray lights around your eyes and stare at Aldebaran for a few seconds to see its redness clearer. (4) Make use of your planetarium/stargazing app in your phone to find Jupiter. E.g. 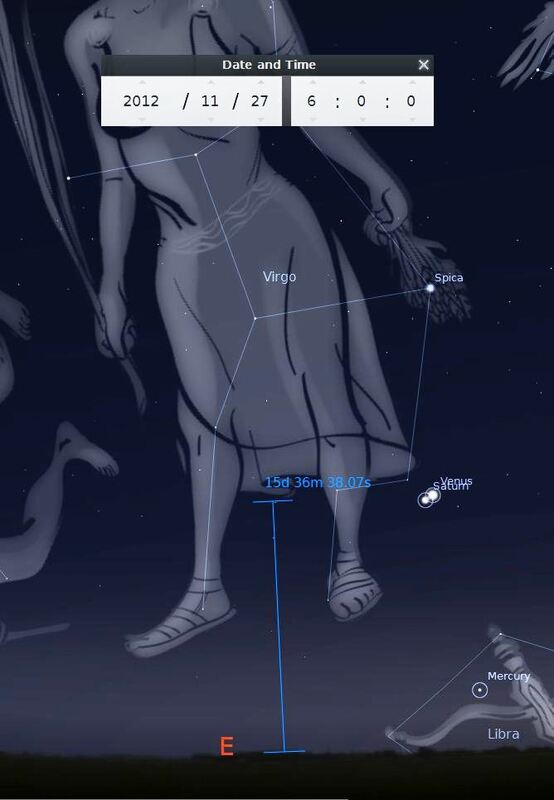 The free Sky Map for Android phones and Planets for iPhone/iPad. (6) Trial and error. Using a binocular or telescope pointing at what you think may be Jupiter and observe what you see. Try to focus your binocular or telescope at the object. It should look a small disc of light instead of a pinpoint source of light. You can observe Jupiter with a pair of binocular. Make sure you have adjusted the left and right focus properly for your eyes as well as the pulling the binocular further in or out to match the distance between your eyes before stargazing. You should see a small white/creamy disc of light which is Jupiter and tiny pinpoints of light which are Jupiter's 4 brighter moons (out of 60+ moons). 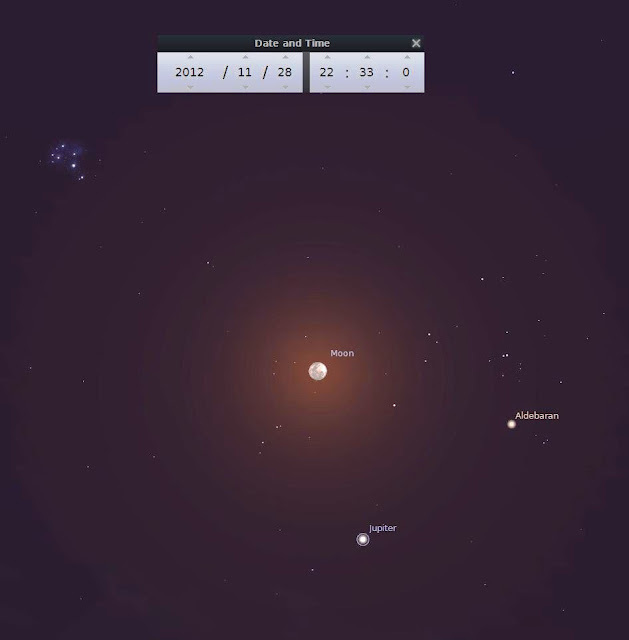 Whenever one or more of these moons go in front or behind Jupiter, you will see less than 4. Using a telescope, you can observe the cloud bands on Jupiter. At certain times, you may see the massive storm known as the Great Red Spot (GRS) on Jupiter. 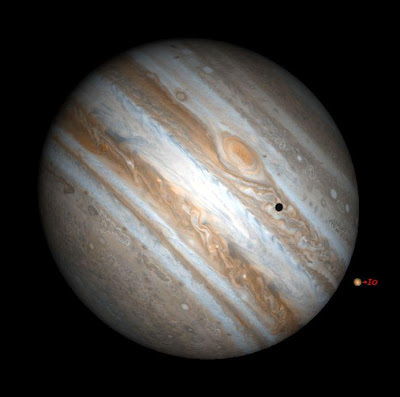 You may also see the moons of Jupiter casting their small round shadow on Jupiter. These shadow can drift across Jupiter over a couple of hours! Do take note these Jupiter imagery you see here and in most astronomy magazines and books are usually images made from long-exposure astrophotography through telescopes and post-processed in specialised software. The actual live view through an amateur-size telescope will NOT be so detail, colourful and sharp. BUT, having said that, the sensation and experience of seeing Jupiter LIVE with your own eyes is something that no astrophoto or video can replace! Just imagine how you will feel seeing something that is "alive" and hundreds of million kilometres away! So, if you do not have access to a telescope, try to join free public stargazing events organised by SINGASTRO members, Friday observation sessions at Singapore Science Centre Observatory and Woodlands Galaxy Community Club. I will be conducting another free public stargazing talk at Toa Payoh Public Library on 8 Dec 2012 (Saturday) - only 5 days after the opposition. Weather permitting, after the talk, my friends and I may be conducting a free public stargazing session outside the library and you can be sure Jupiter will be in our big telescopic sights! As usual, if I conduct any impromptu free public stargazing sessions, I will announce them in my Twitter which you can also read from the main home page of this blog even if you are not on Twitter. Wishing everyone clear skies, good luck and have a great time identifying and observing this wonderful planet during the festive year-end season! Do spend time educating your family and friends that the bright "star" or "satellite" in the sky is actually a planet that can fit in 1000 Earths! 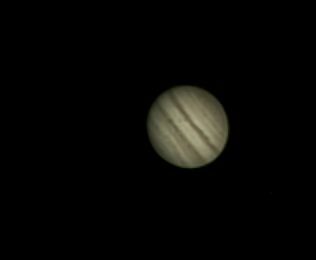 And the Jupiter that we can see is how it looked like 30+ minutes ago! There is a Penumbral Lunar Eclipse happening tonight which will be visible in Singapore if the sky is clear. This eclipse will NOT be visually as spectacular as a Partial or Total Lunar Eclipse. It will only be slightly dimmer during eclipse, i.e. hard to notice if you just take a quick random look at the Moon and didn't know this eclipse is taking place. There are 3 types of Lunar Eclipse - Penumbral, Partial and Total. Penumbra is a partial shadow region between a complete shadow (darkest shadow) and a complete illumination. In laymen terms, penumbra is the lighter shadow, umbra is the darker shadow. Sun, which has a diameter of 109 Earths, shines on Earth. It creates a shadow of Earth beyond the unlit side of Earth. We don't see Earth's shadow at night in the sky because there is usually no nearby object to project this shadow upon - except the Moon. Due to Moon's tilted orbit around Earth, it usually passes above or below Earth's shadow region. That is why we don't see lunar eclipse every full moon when Sun - Earth - Moon forms a straight line. This is a good illustration from Wikipedia. But take note the scaling of the size (and distance) of Sun to Earth is distorted for the sake of illustrating the shadow concepts. Remember the Sun can fit in 1,390,000 Earths! By proper astronomical definition, a penumbral lunar eclipse is different from a partial lunar eclipse. For a lunar eclipse to be defined as partial, Moon must pass through a part (no matter how small) of Earth's darker umbra shadow at any time during the eclipse. For Penumbral, only through any part of the lighter shadow. For Total Lunar Eclipse (e.g. 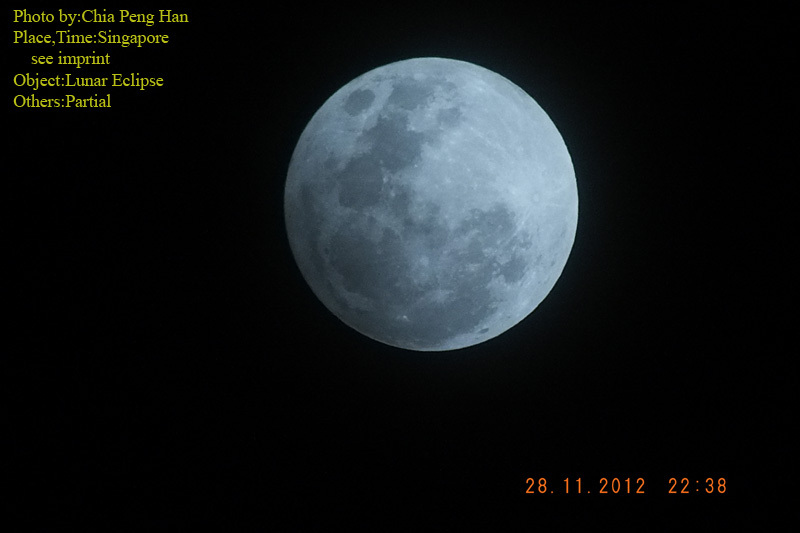 10 Dec 2011 also visible in Singapore), the whole Moon must be inside the darker shadow. (2) Take photos or videos directly or through a telescope to compare the difference. Make sure the camera settings are the kept the same for all the shots (e.g. ISO, exposure, shutter speed). Take note potential thin clouds or haze rolling on and off in front of the Moon will affect the detection and photographic documentation of this slight drop in brightness. Jupiter and the star Aldebaran forms a triangle with Moon. Extending a straight line roughly double the distance from the midpoint of Jupiter-Aldebaran to Moon to the other side of Moon, you will find a tight bunch of stars known as 7 Sisters star clusters (aka Pleiades, Subaru, Messier Object 45). Full Moon's brightness may drown out the naked-eye detection of 7 Sisters but if the weather is clear enough, should be still spectacular through a pair of binocular or telescope. Jupiter is approaching its closest distance to Earth on 4 Dec 2012. But visually you cant tell much of difference from now till then. So observe it whenever the skies are clear enough. Above Aldebaran, notice an inverted V-shape pattern of stars. This represents the inverted horns of Taurus the Bull. Find Aldebaran with your binocular and continue to look slightly above (or around) this star. The gorgeous Hyades star cluster should fill up the binocular view! Remember to breathe when you see these wonders around the Moon! Good luck and clear skies! Saturn and Venus will be very close to each other as seen from Singapore on Tuesday 27 November 2012 shortly before sunrise. They will rise from the horizon at about 5.00am. But the best time to observe them is an hour later at about 6.00am when they have risen high enough from the thicker atmosphere near horizon and the sky is still relatively dark shortly before twilight. If the sky is clear enough for them to be visible, there is no way you can miss it while facing the correct ESE direction - two bright "stars" so close to each other. Close one eye, lock your elbow, extend your arm, raise your pinky finger and its finger tip can cover both of them with room to spare! Venus will be blazingly brightly at magnitude -4.0 on the right and Saturn relatively dimmer at magnitude +0.7 on the left. They are only about 30 arc minutes apart - the wide of a full Moon! The implication of this is that they can be both viewed in relatively high magnification in the *same* field of view of a telescope. Most telescope at its lowest magnification will be able to fit both of them in the same view. This is quite a rare opportunity as sometimes planets come close together but they may be about 3 or 4 arc degrees apart. That means you will need a telescope capable of showing wide views (e.g. 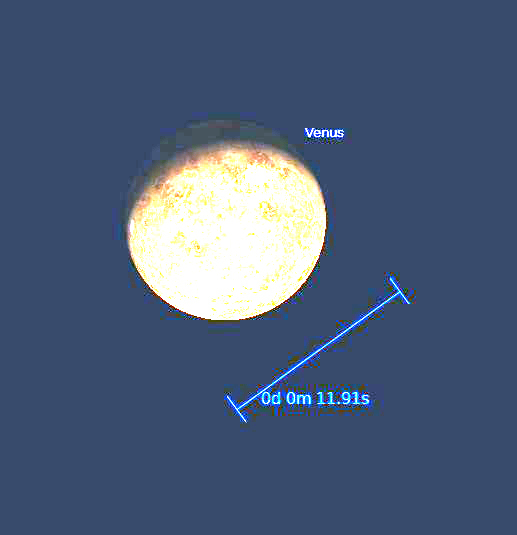 short focal length refractors) which implies lower magnification, which implies less planetary details observable. I have deliberately overexposed this image to show how Venus look like through a telescope - like a bright Moon with phases. Venus's highly reflective and thick atmosphere makes it impossible to observe its surface detail. It is about 12 arc seconds in size. It's apparently size will be about 36 arc seconds (inclusive of the rings) - 3 times the wide of Venus. 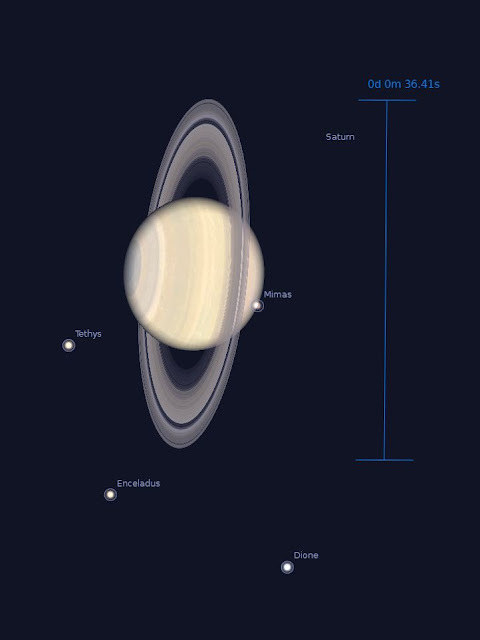 Do take note it is not possible to discern the rings of Saturn in a small, low-power handheld binocular. You need at least a decent basic beginners telescope. Would love to conduct a free public viewing session that morning but it is a weekday morning - good for students on school holidays but not so great for working adults? How many of you are keen to join in if there is such a session? Or you guys intend to organise a viewing session among yourselves and don't mind inviting me to come along with my telescopes? Drop me an email at gary@astro.sg. 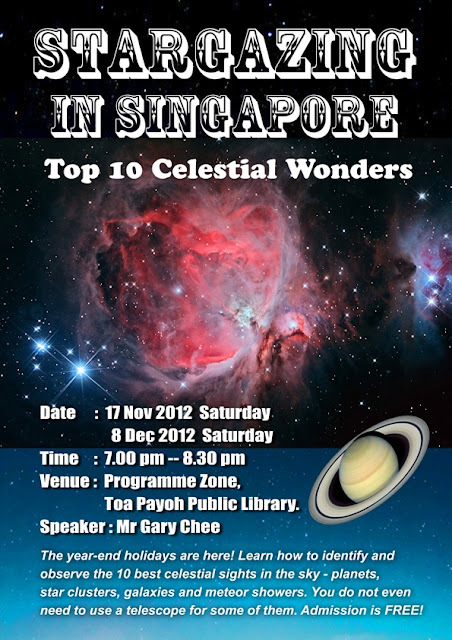 Thanks to the kind support from singastro members, my friends and NLB, the last public stargazing talks at Toa Payoh Public Library in September has been well received. As such, I have been invited again to give free public talks in November and December. Big thanks to Toa Payoh Public Library for sponsoring the venue, audio-visual equipment, poster printing and allocating 2 primetime Saturday evenings during the school holidays for these upcoming talks. Admission is FREE. No pre-registration required. First-come-first-seated basis. Special thanks to my astrophotography friends for granting me permission to use their astrophotos for the poster design and presentation slides. Can't wait to see the audience reaction when these photos are projected on the big screen! The talk content is about how to identify, observe and appreciate the best 10 celestial sights that is visible in Singapore on a clear night from now till early next year. Though the emphasis is in Singapore, the knowledge acquired can be useful for those travelling overseas for their year-end holiday trips. Weather permitting, my friends and I may conduct a sidewalk astronomy session outside the library after the talks. This is totally a separate event not affiliated with the National Library. 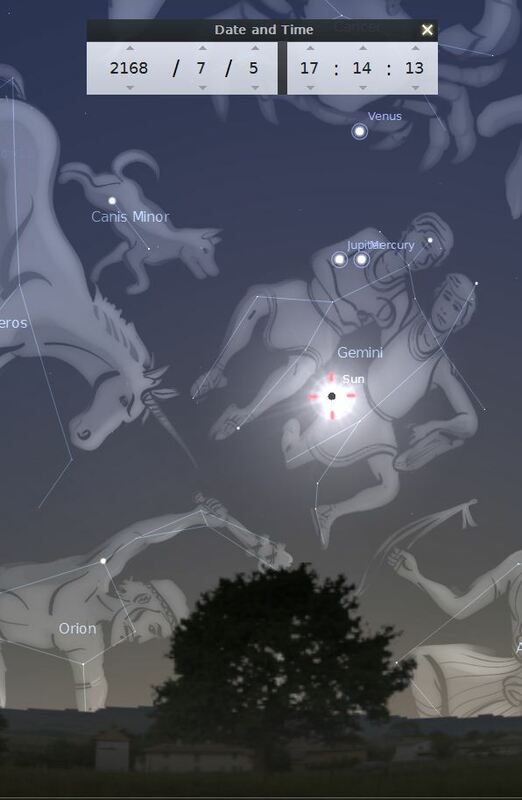 Jupiter and 4-day old Moon will be visible on 17 Nov as well as the Leonid Meteor Shower. On 8 Dec, a few days after opposition, Jupiter will be visible after sunset and for those staying up overnight, Saturn will be 27 degrees above eastern horizon at about 6am and forming a loose vertical line with Moon, Venus and Mercury. And the south will look interesting again with Omega Cenaturi, Crux and Carina! Regardless of the sky condition on those days, the knowledge you acquire from these talks may reward you with many fun-fill stargazing nights for the rest of your lives! So mark your calendars and feel free to join in the fun with your family and friends! 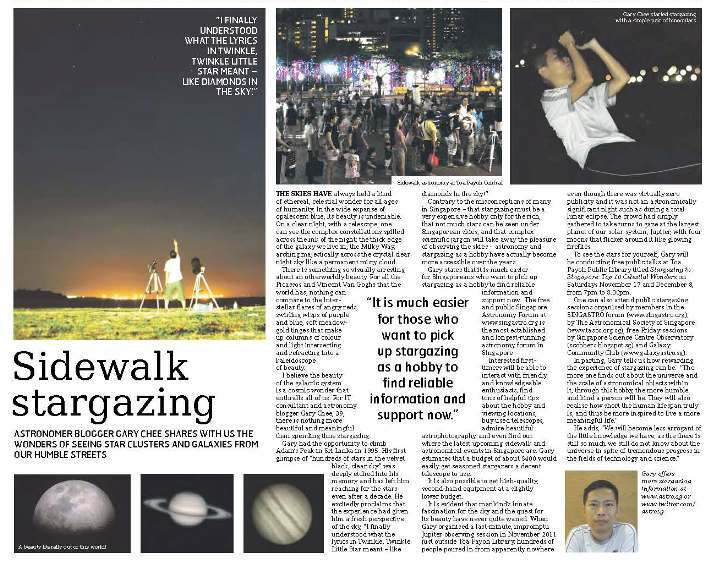 Big thanks to writer Miss Lee Li Ying for the article and Weekender's Editorial Director/Co-Founder Mr Frank Young for the invitation to have stargazing featured as a hobby in Weekender. Weekender is a weekly *free* publication by a social enterprise with the mission statement "Be Happier". This is totally in-sync with Sidewalk Astronomy - spreading the joy of stargazing to the public for free. All issues of Weekender can be downloaded at their Facebook page. It is also printed and sent to local homes with a circulation of about 230,000.
http://www.facebook.com/weekendersgp. While you are there, download and read their previous 6 issues too. You may be inspired to start a new hobby or have a deeper appreciation of people who are passionate about their dreams and their craft. Due to space constraint, it is not possible to include as much content as the writers would like to. As such, I just want my unlimited blog space to share some perspective after seeing the final stargazing article. Hope this will let readers have a deeper understanding of the published article and photos. (1) Crazy dude pointing at sky at a beach. That's Changi Beach in Singapore. 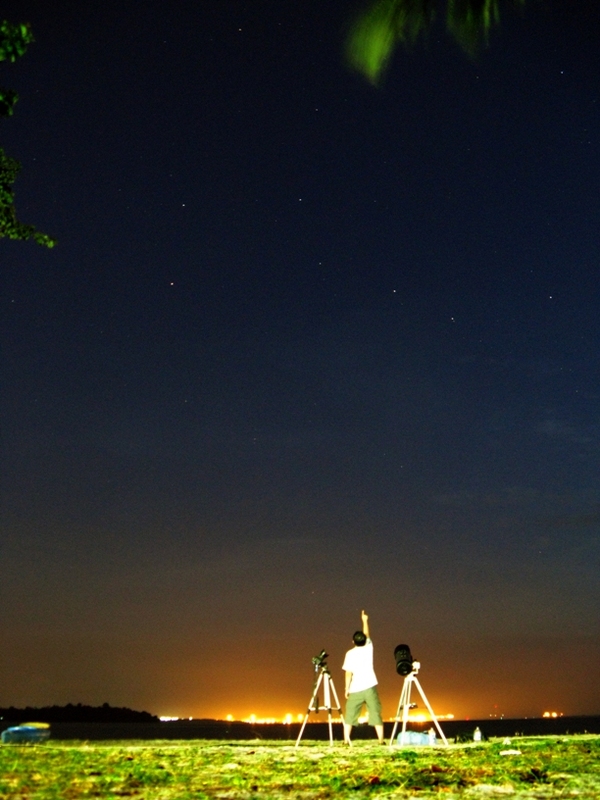 Taken shortly before astronomical twilight It was the end of an amazing overnight stargazing session with Yuan Huan. The asterism in the sky is the famous Big Dipper which it looks like an upside down wheel barrow. Click on it for bigger image. This is long exposure photography from a point-and-shoot camera on a mini flexible tripod. I had to set the timer, dash to the spot and point at the sky and hold still for a few seconds - like a crazy dude. :) The telescope to my right in the picture is my 8-inch Celestron C8 telescope mounted on a Vixen PORTA manual non-computerised mount. Due to the text overlay in the publication, the last 2 stars at the "handle" of the inverted wheelbarrow were less prominent. Thus, reducing the visual impact of the wheelbarrow shape and its apparent size across the sky. But for me, from a design/layout point of view, the upper right-hand corner location is the only suitable location to show the text. Any other location in the photo will make the overall look aesthetically unpleasant. 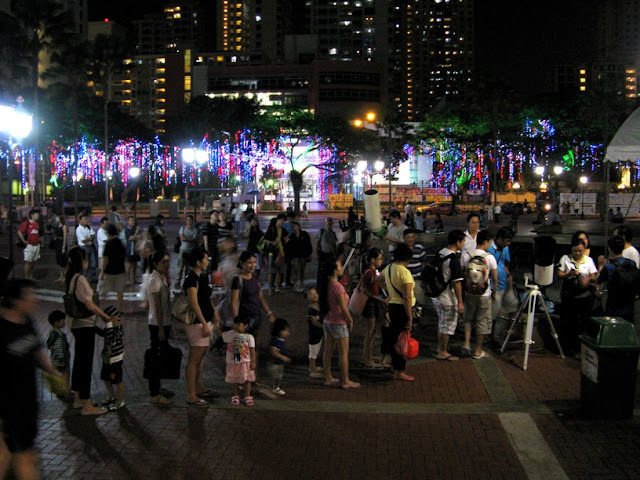 This is our favourite sidewalk astronomy location which is just outside the main entrance of Toa Payoh Public Library. This is the same photo that was featured in Straits Times's "Seeing Stars" cover story in Digital Life as a much smaller photo. There are 2 white telescope there. The bigger white telescope at the back belongs to and manned by James. It is a 10 inch Takahashi Mewlon (premium Japanese telescope) mounted on a fully computerised tracking system. The smaller 8-inch telescope towards the right margin of the photo was my Meade 8-inch telescope (which I had since sold) manned by my Clifford, freeing myself to take this photo. Mounted on the same manual mount as in the Changi Beach photo. The queues were longer than the photo can fit in. And I was too lazy and tired then to do a panoramic shot. Over the years, taking photos of myself observing is the last thing on my mind as there are more interesting and enjoyable things to do during observation and sidewalk astronomy sessions. Thus, this published photo is a last-minute wayang (pretend) shot taken on Deepavali a few days ago for this publication as the writer requested for them after I had already submitted the rest of the photos earlier. Most important thing to note, the location is at Bishan - Ang Mo Kio Park. 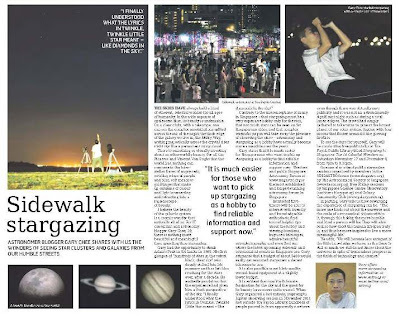 A great location for private and sidewalk astronomy made popular by Dave and friends (www.facebook.com/BishanParkSideWalkAstronomy). The reclining benches there are excellent for comfortable binocular astronomy and meteor shower hunting. 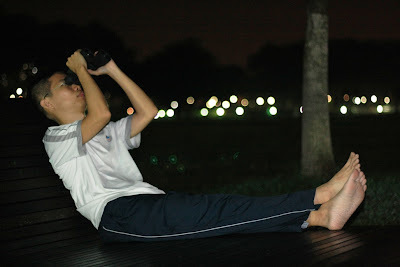 The better but super unglamorous posture for binocular astronomy on the bench is this: - back lying down on the sitting area, legs propped against the back-support area and using a binocular to look straight up at zenith which is potentially the clearest portion of the sky. Which was what I actually did during my last solo overnight session there where I shot Orion with my camera phone and twittered it. 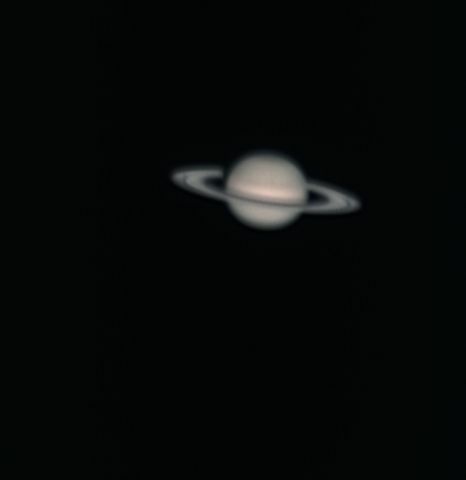 One my earliest if the not the first serious attempts at planetary photography under average sky conditions with my Celestron C8. 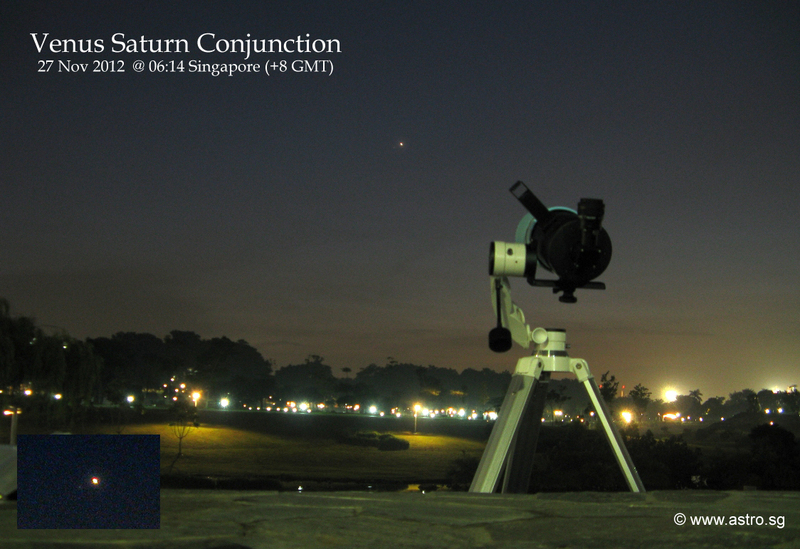 Jupiter was shot in northern Johor, Saturn in Toa Payoh. Not sure how much details will be lost in the printed version of Weekender. But ironically, because of its poor quality, it simulates quite realistically how they look like live through a telescope with decent quality optics under good sky conditions. 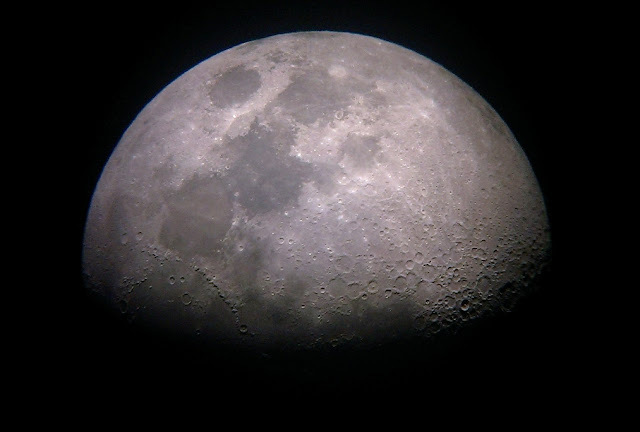 This is a single non-stacked photo taken with my camera phone handheld over the eyepiece of Dave's Celestron C6 telescope on a manual tripod and mount - no complicated astrophotography setup required. Taken during a good run of clear skies in September this year. This is a photo not selected for the final publication. 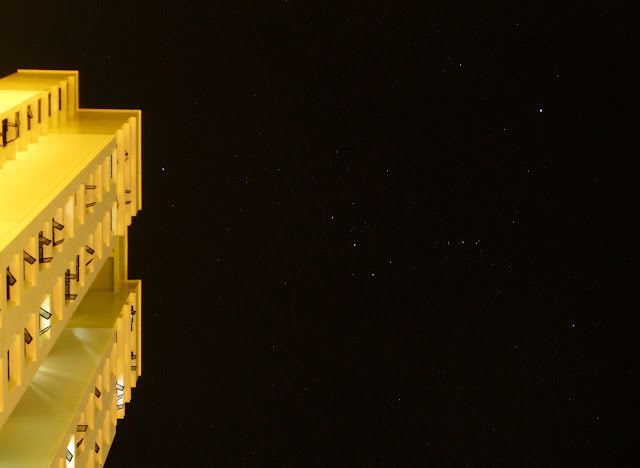 Orion captured one day after Christmas at the public sky garden at 12th storey at Block 79 - the tallest buildings in Toa Payoh. Fifteen seconds long-exposure single shot taken with my point-and-shoot camera and basic post-editing in Photoshop. Observe the iconic 3 bright-stars-in-a-line belt of Orion. Again, this is not representative of the current high standard of astrophotography by local amateur astronomers. This article will not be possible without the unwavering support from my friends. Especially those from the SINGASTRO forum. You know who you are. So a big THANK YOU to you all. You guys and gals are the unspoken heroes who have been supporting this hobby in Singapore over the decades despite the ever-increasing light pollution and general lack of interest from the mainstream media and the formal education system. There is Total Solar Eclipse happening on early Wednesday morning 14 November 2012 from 04:35am *Singapore* time. On solid land, this eclipse is only visible in north eastern Australia. Official NASA information about the eclipse can be found here (pdf). Singapore's eclipse-chasing couple Joo Beng and Janet will be joining many others on a cruise ship to catch it. Wishing them all the best and clear skies! Saw that? Year 2168! 156 years from now! The previous occurrence is 1826. So if anyone alive today tell you they saw a Total Solar Eclipse in Singapore, please ask him/her to submit an application to Guinness World Record for being the oldest person in the history of mankind. How about the next after 2168? Even more scary. Hitting the search limit of year 3000 in NASA's software, I cannot even find another occurrence! So the implication is clear. If you want to see it (or see it again) in your lifetime, you have to plan to travel overseas. I guess 21 August 2017 in USA will be a good opportunity as the eclipse sweeps from coast to coast. Singaporean eclipse chaser did it again! This is his report as first posted in Singastro. Click on the link to see the amazing photos! "Experienced the Solar Eclipse on 14 Nov 2012 from somewhere in the Pacific Ocean, between Fiji and New Zealand on board a cruise ship called the Celebrity Millenium. It was a trip of a lifetime, and I decided on this approach owing to the eclipse path, giving us a viewing time of about 3 and a half minutes. I was pretty apprehensive at first, since the combination of wind, the rocking of the ship, the wooden decks, are all an unstable platform for photography. The ship had the advantage of manourverability, so cloud and weather was certainly a concern, but not as much as from land. Having been through this, I would highly recommend this option now if a similar opportunity presents itself. I managed to image the eclipse with a Canon 60D through a William Optics 72mm F/6 fluorite refractor. A first for me was being able to capture some prominences during 2nd contact. Previous attempts were either of insufficient resolution or unfocused. Unfortunately, I was so busy trying to capture the corona, thinking that 3.5 minutes was a lot of time, that I totally missed 3rd contact. But all in all, I was very pleased with the results. I kept all my shutter speeds to above 1/500 and just increased the ISO from 100 to 800+ where needed. Here's a preliminary photo and will upload more when I have processed them and have access to a better internet connection!